3-heads linear powder filling machine and weight control. Pneumatic extraction unit with clamping pliers for the translation of 3 bottles per cycle. Lifting unit in the dosing area with 3 independent load cells. Bench in aluminum profile, covered with stainless steel panels. The screw system (cochlea) advances the vials one step further, spacing them according to the center distance of the dosing group. 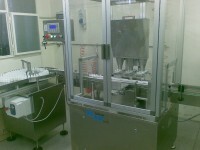 The pneumatic extraction system, mounted on the bench (under the conveyor belt), takes 3 bottles, places them under the dosing nozzles and lifts them. The pliers open and leave the bottles on the load cell. The dosage is carried out with the partitioning / closing and weight control system. The vials are returned to the screw system and are passed to the next cycle. The dispenser output conveyor belt introduces the bottles of the next machine. In case of dosage out of tolerance the machine signals the anomaly for the rejection of the bottle. The system automatically adjusts to maintain the weight in the defined range of values.